We truly strive to provide as much detail for our products as possible and confident that is why we have less than one-half percent of total Sales ever returned and sadly about sixty percent of those returns are incorrect Watch Face sizes. Let me first start with 'If you are a women trying to replace your current watch face, please do not assume it takes a 'Women's Watch Face'. Our watch faces are categorized by Men's and Women's based on our inventory of Native American Watches and Watch Tips (the Sterling Silver portion that attaches to the Face and the Flex Band). Although Native American Jewelry is/can be Unisex, the maker usually has a gender in mind when creating their treasure. 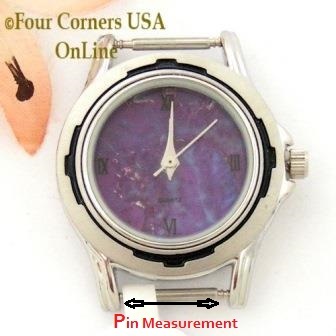 Many Women wear the larger style Men's Native American Watches and therefore it is most important to Measure the Pin for proper replacement. Although we carry a number of sizes for today's watches, there are many millimeter Pin Sizes/Lengths available on the market. Typically Native American Jewelry Watch makers keep to a certain guideline for current availability of Faces based on Men's or Women's watches, older vintage Native American Watches may be an 'odd' size compared to current market availability (made 20-30 years ago based on availability then). Not all tips and faces are a perfect fit and in fact, sometimes a tip may need to be filed down slightly to achieve the movement that is necessary when attached to the face. The image here shows the area that needs to be measured in determining the Pin Size. All Watch Faces are determined by the Pin Size in a millimeter measurement (found on most all rulers). The other consideration to get an idea of how the Watch Face will look on your Tips is to measure the diameter (straight across, not up and down). The Face measurement can vary even though the Pin Sizes are the same and that would be true with our Stone and Coral Watch Faces which are slightly larger diameter than our regular stock White and/or Black Faces for bolder look. The other consideration is the overall Length of the Watch Face which would be useful when measuring for a replacement flex band as well.